Master Haim Sasson direct student of Emrich “Imi” Lichtenfeld, one of the highest ranked Krav Maga experts from Israel. Gheorghe Husar Explains: “I was born for this purpose. The knowledge, skills, and tactics I have learned from: Close Protection, Martial Arts, Military Service, and High-level Fire Arms Courses and Practice. Spartans Academy of Krav Maga allows me to channel my skills and knowledge through classes and seminars to students across the UK, Europe, and the World. I served 11 years as a sergeant in the Romanian Army. Prior to the beginning of my Krav Maga journey in 2002, I studied: Boxing, Fencing, and Wrestling (with one of Romania’s Champion Wrestlers) from a very young age. I spent over 17 years studying traditional martial arts reaching 1st Dan Black Belt in Shotokan, Red Belt in Taekwondo under the World Taekwondo Federation (military version), and Brown belt in Kyokushinkai under the Romanian Martial Arts Federation (FRAM). I am a qualified Shooting instructor, with Distinction, Physical Training Instructor, Combat (Self Defence) Instructor, and a respected martial arts champion – having participated in multiple full-contact and non-contact military & Civil martial arts competitions,” concludes Gheorghe. Trained by the direct students of Emrich “Imi” Lichtenfeld, the highest ranked Krav Maga experts from Israel and Europe, prior to (and after) successfully completing the Krav Maga Instructor course in 2007 under Eyal Yanilov. 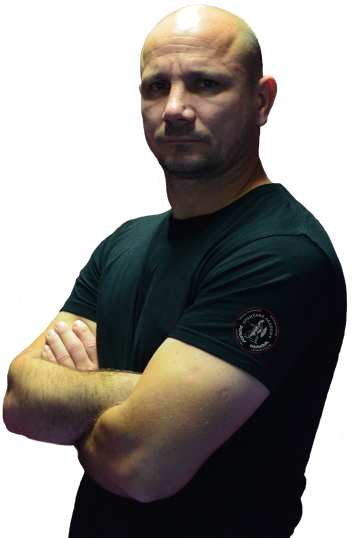 Since then, Gheorghe has continued gaining and advancing his Krav Maga, Self Defence and Professional Firearms training and knowledge (theory and practice of) under Itay Gil (Israel), Mark Dawes (UK), and Euro Tactical (France). Copyright © 2017 Gheorghe HUSAR. All rights reserved.